My Wonderful Video and Photo Adventure in Canada. Images Courtesy Abraham at ODL-Designs. VSL Baby Wrangler, Kirk Tuck, calms the talents' two month old daughter. My time in Canada is coming to an end and it's a crying shame. Everyone I met here, and everyone I worked with here, was kind, happy, helpful and just flat out wonderful. I've spent the last three days just consumed with making video and I'm heading back home tomorrow with well over 100 gigabytes of 2K and 4K video content. I could not have asked for a more fun work project. I landed in Toronto on Tues. evening in the middle of a big ice storm, grabbed my rental car, and headed slowly down the QEW to Burlington where I checked into one of the Hilton suites hotels. It was situated about 500 yards from my client's offices. About a thirty second commute every morning. All the lights and the audio gear arrived without incident. The only injury was to one of the locking screws on the fluid tripod head but it was still usable. I checked out the gear, repacked and then hit the bed in anticipation of a fun day ahead. The next morning I donned on my long underwear, a couple shirt layers, my warmest shoes and biggest gloves and made the 30 second commute. I was warmly greeted, given a tour, given my own "all access" key card and left to my own devices (in a good way). I'd planned for this day to be a combination scouting and B-roll harvesting day. I walked around, from lab to lab with my Sony RX10 iii, a Lastolite white balance target disk and sometimes, a tripod. I shot at least one hundred B-roll clips with one break to go and grab a couple fresh and tasty slices of pizza from Longo's grocery store. In the late afternoon one of my clients took me on a scouting trip of local parks. It was 12 degrees Fahrenheit outside but my haberdashery was more that adequate. On Wednesday evening the CEO of the company took me to dinner at an amazing restaurant where we enjoyed a great meal and discussed everything; from the attributes that made (make) the Leica M3 such a desirable camera to the intricacies of his industry. And lots more in between. On Thurs. morning we started in earnest, interviewing a user of one of my client's products, documenting the alignment and adjustment of a CPU powered prosthetic, and then going to a nearby park to document the user's incredibly good mobility. 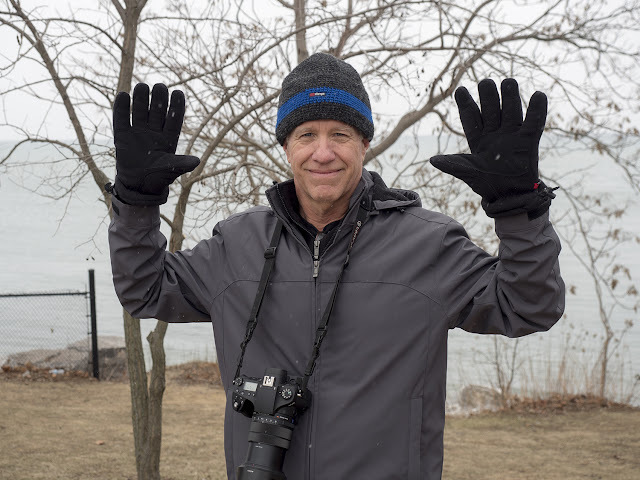 I shot the interview with the A7Rii and kept myself efficient and entertained by again shooting buckets and buckets of B-roll with the RX10iii, along with lots of stills on the RX10ii. It's hard to find quiet spots in busy offices to record interviews but we did our best. The Sennheiser MKE 600 was my microphone of choice and I was again impressed by its detailed reproduction of human voice. I dislike using lavaliere microphones as most non-pro talent moves around, touches their clothing and creates a lot of random noise. That's one thing hyper cardioid and super cardioid microphones are relatively immune to.....clothing rustle. The 600 was routed through the BeachTek XLR interface on the way to the camera. I monitored the audio with headphones but couldn't use the Aputure video monitor with the "A" camera because it is only a 1080p monitor and our "A" camera was set up to shoot in 4K (UHD). We had a relatively big group from the client side. Product managers, marketing managers, a make-up person, the talent and the talent's wife and then, of course, there's me. After a nice, catered lunch in our main shooting area we all suited up and headed to one of the local parks. Our talent, who is walking on a high tech prosthetic leg, navigated a long, gravel path, stepping over lots of tree roots and tackling inclines galore. I shot wide, medium, tight and extra tight shots of everything. I figured out that the "active" setting worked best for image stabilization but we don't have that setting available for 4K (only standard in 4K) so I dropped down and shot in 1080p, but at 60 fps so we can slow down the footage in post and do a "half speed" slo-mo. The active I.S. worked well and, after inspecting the footage on my laptop back in the hotel, I am impressed. The I.S. is not as good as the Olympus I.S. but then, what is? After a long day of shooting and getting my bearings at my client's facility I had the pleasure of meeting a Toronto-based VSL blog reader for a wonderful dinner. We ate and talked for three hours and I'm sure I bored him to tears but he proved to be a wonderful host, and quite resilient since he volunteered to come back this morning and assist me on the busiest day of our three day project. He also shot these great behind the scenes images. 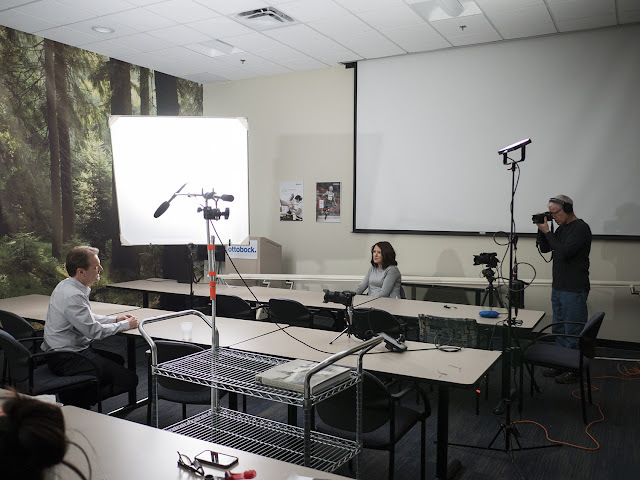 Today we interviewed two different people, one product user and one clinician. We also got action shots of the technical experts calibrating and testing a prosthetic for that user. 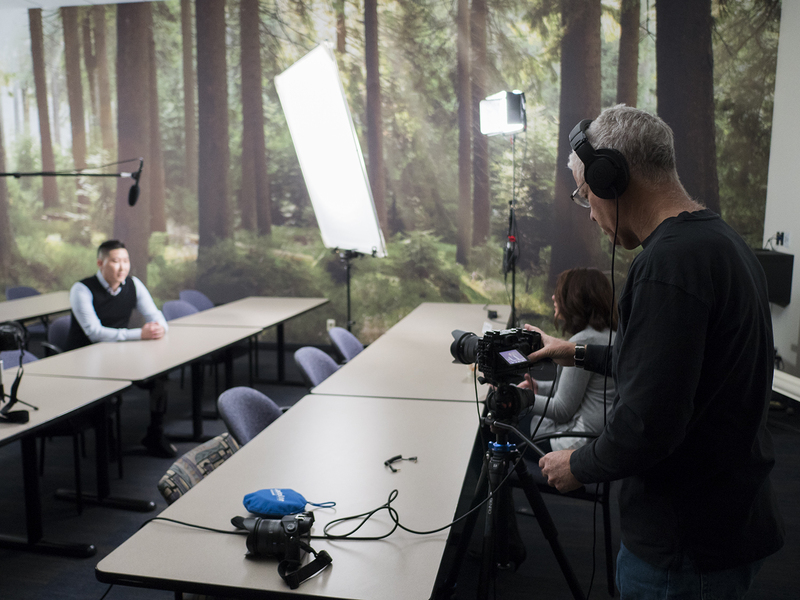 I'm sure I came across as unorganized to my fellow photographer/assist as I tried to juggle an RX10iii on a Leica table top tripod at one shooting angle, the A7Riii as a primary camera and also carry an RX10ii for still photos in between monitoring audio and video. It wasn't too big of a stretch as we had a person from the client side actually conducting the interviews. I'm always nervous about video content until I get back to the studio and back up the memory cards to my little laptop. I was exhausted by the time we wrapped up, what with baby bouncing duties and keeping track of all the details, but my VSL reader/volunteer, Abraham, helped lighten my load by assisting me in disassembling all the gear and helping to pack it out to the car. I am so thankful that he came along with me instead of me muddling my way through the busiest day solo. Thank you! Thank you! Thank you! Stepping away from the video camera to take some silent still photographs with the "C" camera. Monitoring the audio and the "A" camera for David's interview. Canadian clients head to the car while the video team keeps shooting the Lake Ontario shoreline in a valiant attempt to log enough b-roll. Around the time we headed for our exterior location the wind began to blow and the snow began to fall. It was exciting for me. I'm from central Texas, we don't see this kind of weather much. Not so exciting for the natives who seem to have lost their sense of amazement concerning frozen precipitation. The big gloves are from REI and the thinner "camera control friendly" gloves are also from REI. So is the hat you see and the little Polartec skull cap underneath. I was toasty warm but the best part is that I found the jacket at Costco for about $29 and it seemed as warm as anything my Canadians were wearing. 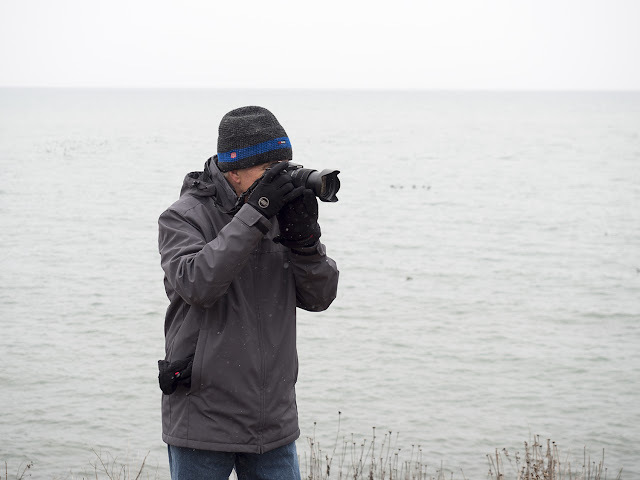 Never a shiver, even after 30 minutes shooting in the wind, and standing adjacent to Lake Ontario. I guess we Texans aren't that slow on the uptake, when it comes to personal comfort. A naysayer suggested that I did not have good cold weather gear; or the world's warmest gloves. Au Contraire. Here's proof. Tossed in the Sherpa hat for good measure. Me cold? Not likely. Early to bed tonight as I've heard the U.S. Custom in the Toronto airport is notorious for long lines and big delays. I'd rather be five hours early than five minutes late. Besides, the family moved our traditional Thursday pizza night to Saturday evening just so I could share in the fun. I wouldn't want to miss my flight and disappoint them. Canada Rocks! The people are great. The food was great. I give the whole experience five stars. Now comes the hard part, reviewing and editing all that footage. Good night!